Real prepare for arrival of Bale from Tottenham. 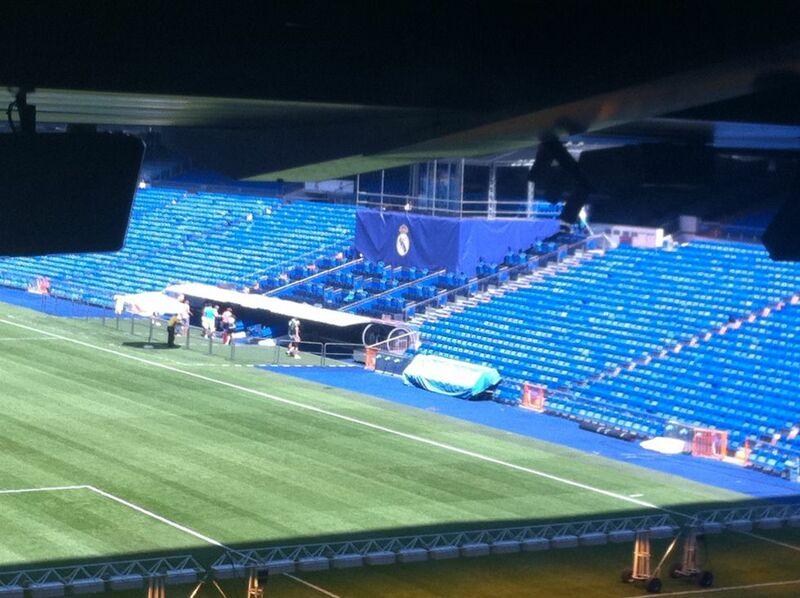 Real Madrid appear to be erecting some sort of stage at the Santiago Bernabeu, further prompting speculation that Gareth Bale’s transfer from Tottenham is imminent. The above image is from the facebook page of Real Madrid’s Polish fan club, while Spanish daily AS carried this picture on Friday of what looks like a press stage at the Bernabeu, embossed with Real’s crest. In Spain, it is standard practice for new signings to be unveiled in the stadium in front of adoring fans and media, whilst doing a few kick-ups in club colours. Although various reports suggest a deal to take Bale to the Spanish capital is imminent, Spurs’ failure to land Willian – who has opted to join Chelsea – could see the Welshman’s move put on hold once again, as Spurs look to tie-up their summer transfer business before Bale’s departure.